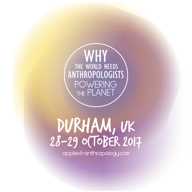 The fifth edition of the annual symposium Why the World Needs Anthropologists will be held at Durham 28-29 October 2017, and explores how energy professionals and anthropologists can cooperate to design and deploy energy innovations that alter the world for the better. APPLY will be running an interactive workshop ‘Insightful Jobs - Demonstrating the Value of Reflexive Thinking’ on Day 2. Join Jessica Symons and Zem Moffat for insights on using anthropological methods as reflexive thinking tools in a range of applications, and strategies for selling anthropological skills in commercial and public sector contexts. Registration is open via the Why the World Needs Anthropologists website. 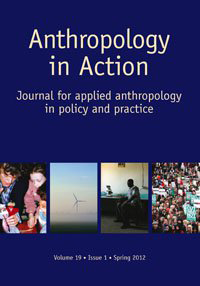 Anthropology in Action is the journal of the combined Apply and Anthropology in Action networks. It is an international peer-reviewed journal publishing articles, commentaries, research reports, and reviews. Contributions reflect the use of anthropological training in policy- or practice-oriented work and foster the broader application of these approaches to practical problems. The journal provides a forum for debate and analysis for anthropologists working both inside and outside academia and aims to promote communication amongst practitioners, academics and students of anthropology in order to advance the cross-fertilisation of expertise and ideas. We are always happy to receive contributions,whether conventional research-based articles or contributions such as letters, debate and comment articles, reviews, personal accounts of working experience and events reports. To find out how to subscribe and contribute, click here. In 2016, we convened at the ASA Conference in Durham, where we agreed a future strategy of moving away from a focus on London-based meetings to explore other ways in which the network can best reach its constituency and support anthropologists working in applied fields, such as via webinar technology. A recording of the online business meeting held in January 2017 can be viewed here. In February 2017, we held an online seminar on the topic: The Business of Anthropology: Ethnographic Observations on Corporate Social Responsibility Programmes in West Africa. The seminar can be viewed here. To comment or ask questions please contact Sal Buckler at e.s.buckler(at)rgu.ac.uk, or tweet using the hashtag #ApplySem. We are excited to pilot this new way of APPLY working together - and if you are a member of LinkedIn, we’d also like to encourage you to join the ASA Apply Anthropology Network LinkedIn group. Please email the network convenors if you would like to arrange an event and/or use the ASA APPLY Anthropology LinkedIn Group to communicate with other members of the network, and to propose and organise events. At the beginning of the twenty-first century we are working in a context where anthropologists, anthropological approaches and ethnographic methods are increasingly important in informing decision-making in the public sector, industry and NGOs. The ASA Network of Applied Anthropologists (‘Apply’) aims both to serve and draw closer together practitioners of applied anthropology working in and outside academia, students seeking a career as an applied anthropologists, teachers and trainers in applied anthropology, and employers and clients of applied anthropologists. This website is an organic and growing project, it does not simply provide information but relies on its users to send texts and links to participate in the development of this project. Please use the navigation bar on the right to browse the site, join the network's mailing list, view our directory of applied anthropologists, and read about our events. Download a poster advertising the network by clicking here (pdf format). Remember that the ASA encourages you to be a member, and the ASA works on your behalf to represent anthropology as a profession at the highest levels. You can find out about types of membership and support the ASA through the membership pages. The network is convened by Julie Scott (Julie(at)touchtd.com) and Sarah Buckler (e.s.buckler(at)rgu.ac.uk). The Applications of Anthropology website was developed as a result of Applications of Anthropology and ESRC Seminar Series funded by the ESRC, the ASA and C-SAP and convened by Sarah Pink in 2003. It provides an online space for the promotion, discussion and development of applied anthropology in the UK. Please send any comments or content you would like to add to the site to the network convenor.